The fall has been busy with the usual Ghost Walks and Halloween activates. Part of our job has become to be a “listener” for those that have unexplained happenings in their lives. During one event a lady stopped by asking for assistance with “a spirit in the house”. The lady brought one of her daughters to talk to me. Apparently there are several other children in the home and all of them have seen a young girl. 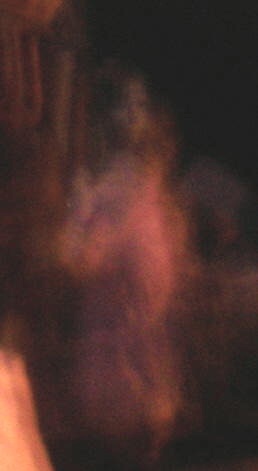 The spirit seems to try to communicate with only the younger people in the house. We are always willing to hear anyone’s stories and give what advice we can, but we do have our limits of expertise. The lady was told a story by her neighbor where a three or four year old child was hit by a car and killed. It is believed that this child haunts the area and the apartment in which the woman and her family now live. Our discussion started with my asking several questions (i.e.) What is the address? Do you know the names or at least the last names of the people that lived there before? Do you know the date the child passed? With this information we were able to minimize our search to certain areas. We started by researching the history of the house by looking up the address in the older Polk Directories. A listing was found for a woman who lived in the same apartment during the time span the death occurred. It seemed that she moved one year after the approximate time of the accident. The library houses reels of microfilm for the local newspaper and this allows us to begin searching the films during the dates we believed the accident to happen. Unfortunately we were unable to locate an obituary or mention of a child’s death in an accident during that time. The woman is still in contact with the neighbors and is planning on asking them more questions. With the new information we hope to continue the search. Although we do our best to pass on information and helpful hints we are not actual “ghost hunters”. Ellie, Bianca, Hannah and I do our best to keep informed and educate ourselves so we might answer your questions. We are in contact with several groups that are true ghost hunters and we would be happy to put you in touch with them. Please understand, we are interested in your stories and plight and we are here to help you with what we can. Thank you for understanding. The following are ghost hunters that have investigated the SWCL. Each group seemed professional and knowledgeable. Tour guides were Ellie Davis, Bianca Jorgensen, Hannah Redden and I Micki Gilmore. From the moment I walked into the building to prep for the Ghost Walk tours I could feel a difference in the air. Sometimes there is a type of “charge” to the air that just feels different and I always know we will have a good Ghost Walk. Tour #1-8pm: Main Guide-Micki-As I started to hand out the ghost hunting gear the KII’s went off immediately. I had just handed them to the random tour members and the lights started going off. Everyone was very excited. We proceeded as usual with the Prayer of White Light and started the tour. The standard is to start with the Ladies Room. The tour group entered and we began asking questions. One of the women in the group said she felt like a child was standing next to her. The KII went off and we asked her to try to get an outline of whatever it was. The KII did seem to outline the shape of a small person. We then did an EVP session. (Evidence has not been reviewed as yet). The tour then moved on to the other areas of the library. We did get some activity in the Youth Services area and Young Adult area. 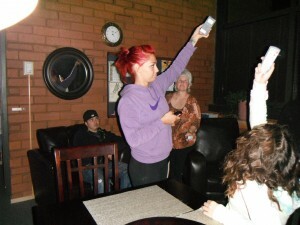 Again in the Young Adult area we did the EVP session and also tried the Ghost Box. There did seem to be responses on the ghost box to our questions. The group moved on to the Staff Lounge. Once again the lady that felt the child said she thought the child was with her. The KII did seem to indicate the same. There was a large amount of hits from the KIIs in that area. Everyone seemed very pleased with the activity we witnessed. Tour #2-9:30 Main Guide-Ellie-From the moment we started handing out equipment the KIIs started lighting up. The group members seemed very excited and spirits seemed to respond to that. The Ladies Room seemed to be active and there seemed to be a good energy or so people reported. The tour moved on to the Youth Service area and Ellie began telling several of the stories. The KIIs seemed to respond to the stories. The group moved on to the Young Adults area. We asked the spirits to move the glass mobile that hanging in that area. We have had some luck with this before. To our surprise the dragonfly on the mobile did move. I was taking video of this and I think I was able to catch it. I will report on this more when evidence has been reviewed. We were able to get some answers on the Ghost Box and I hope I was able to get this on video as well. The tour moved on to the back workroom and on to the Staff Lounge. There seemed to be activity on the way up the stairs and into the hallway. Hannah was to the back of the group and she reported hearing voices in the hallway. Hannah and Bianca were working the new gadget the Ovilus. As words came up Hannah wrote them down. It seemed to be working well. Tour #3-11pm Main Guide-Micki-S. P. and her husband, son and his girlfriend were part of the third tour. She reported to me that she felt “someone small” with her. She said she couldn’t believe it. The KII’s again went off in the Multi-purpose Room before we even started the tour. Lot’s going on. J. V. was on this tour and he stated that he had never seen so much activity and he had been on one Ghost Walk each time we have had them for the past four years. Activity included KIIs lighting up to our questions, KIIs and EMFs lighting up or sounding off to the shape of a small and large person (?). The Ghost Box seemed to get answers to the questions; the Ovilus seemed to get words to match the questions. Very exciting stuff. A lady came to this Walk that had been a year ago. She then had reported what seemed like a child tugging on her sweatshirt sleeve. She said she had come back to see if it would happen again. It did not to her, but she saw what happened to S. P. and she said she felt ok about it now. She had worried before and she said she sees that it is just possible children following us around. She seemed very happy to be there. A couple teen girls used the KIIs and EMF and were able to trace a very tall “being” just by the table in the Staff Lounge. You could feel “an energy” in the room at the time. Pretty cool I must say. Tour #4-12:30am Main Guide-Ellie-As with the other tours, the KIIs began lighting up as soon as they were turned on in the Multi-Purpose Room. The Lady’s Room had a good amount of interaction with Q & A and the gadgets. Ellie tried the ghost box and it did seem there were a few answers giving. As we moved on to the Youth Service area there was also hits on the KII and what seemed to be answers to questions on the Ghost Box. As we moved on to the Young Adult area things seemed to pick up a bit. We had noises and there seemed to be a small person walking along with us. We thought it was a child. The KIIs seemed to trace an outline of a child as well. The mobile that hangs in that area was still until we asked the spirits to move just the dragonfly. It did it again. Everyone was excited. We then asked them to stop it and it did. It was cool to see. We moved on to the Staff Lounge. The stairs seemed to have something going on. When we got to the hallway Ellie said she smelled smoke and someone else also mentioned they did as well. We sat around the table and there seemed to be spirits with us and the KIIs went crazy. They lit up to red many times. A woman mentioned she felt a possible child, a girl, was with her. The KIIs seemed to outline a child. I really think the ghost kids were there with us or at least one was. We had trouble with the Ovilus so we didn’t use it this time. Ellie used the Ghost Box and there seemed to be answers to our questions once again. Overall the feeling was high energy. We went back down to close the tour and the KIIs just kept going on and on. I have not reviewed the evidence yet, but I am looking forward to it.